©Barry Sandland/TIMB – When in the middle of nowhere, an extra water bottle is a best friend. Photographer’s notes: If you look at his bike, there is a presence of water bottles as well as the extra bidon strapped under his seat, even more in the backpack. Being a local rider, he knew the conditions. Once over this hill, there were few and fewer places to get water. There would be longer spaces between lakes, ponds and streams. The heat was going to eat away at me and water was going to be invaluable. His offer to send his support vehicle up to me and refill my water bottles was a generous offer. Luckily, there were still plenty of ponds, lakes and streams. There are some huge distances in the NorthWest Territories, Canada. One hundred kilometres between houses. More. No gas stations. No grocery shops. No sign of mankind, save the occasional cottage. Any cyclist trying their legs here had better be able to cope with drinking from less industrial water sources. I have a cast iron stomach so, with a bit of caution, I refilled my bottles time and time again over the next three days, the heat draining me and over 20 litres of water being swallowed every day. Luckily, out in the wilderness, water sources are clean – or clean enough. 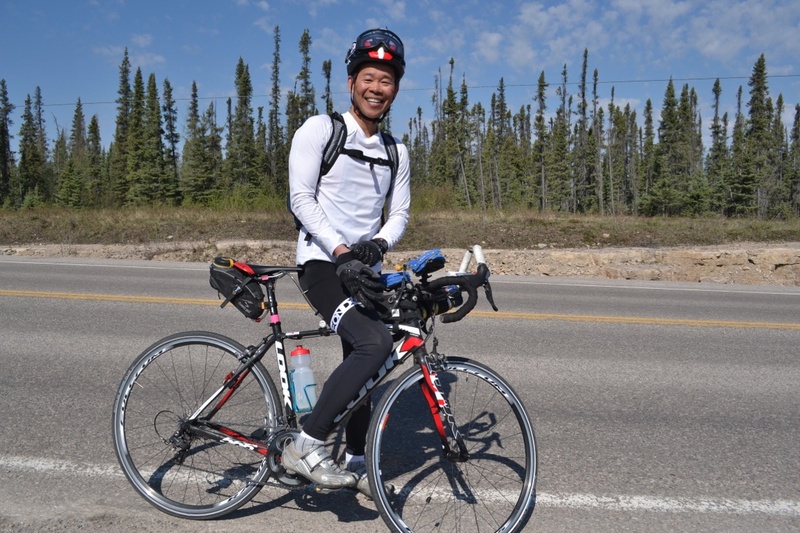 This entry was posted in North America, roadbike and tagged Canada, June, Northwest Territories, Race Across America, ultra-endurance. Bookmark the permalink.